"It just doesn't go out of style." Is the blue blazer timeless? That's what I hear. What about PC/104? Absolutely. In the embedded market space, longevity is key. Embedded systems go through ­rigorous testing and qualification; the systems need to last. 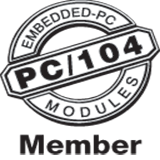 While new form factors and specifications sprout up continually, PC/104 is a solid, time-tested architecture that can be trusted in applications that require reliability, wide industry support, flexibility, and long-term sustainability. Systems built with the PC/104 stacking architecture are versatile. Based on their configuration, they can be tailored for any number of transportation, industrial, defense, mining, gaming, and aerospace needs. The editor was notified of this error on: Monday 8th of April 2019 01:35:27 AM.